Try this recipe for a flavorful and satisfying white chicken chili. This hearty slow cooker pork chili with pinto beans gets its smoky flavor from the combination of chili powder, cumin, oregano. tomatillos, and Mexican-style hot tomato sauce. This lightening speed chili is done in about 30 minutes time. By blending the bean with some stock, it creates a smooth texture that normally takes hours of simmering to achieve. Fresh tomatillos look like small green tomatoes wrapped in thin papery skin. Remove skin, and rinse before chopping. If you can't find fresh, look for canned on the Latin aisle at the grocery. This hearty and comforting chicken chili is made with poblano chiles and butternut squash. You can make individual servings in 10-ounce ramekins or one large pot pie using a 3-quart baking dish. Either way, everyone will love the puffed, cheesy cilantro-grits crust. 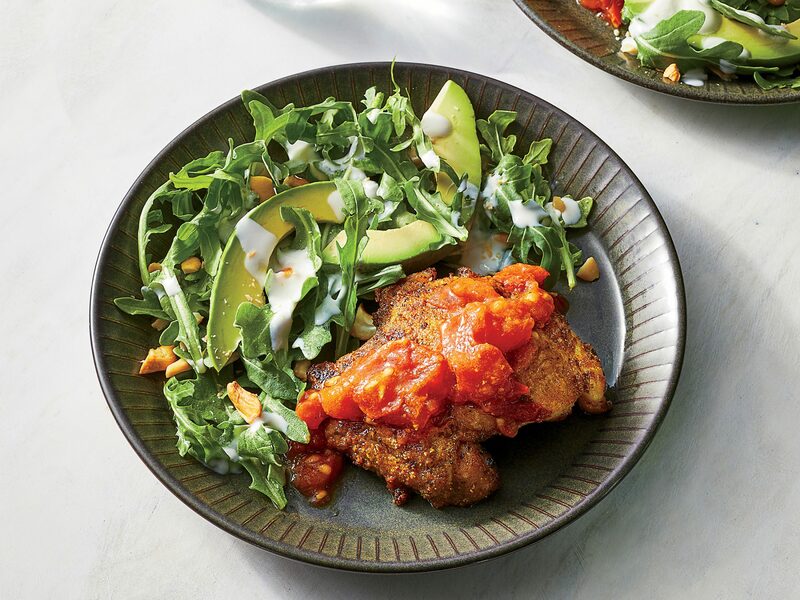 Chipotle chiles add a kick, but sweet potatoes balance the heat. Adjust the spice in this homey chili by increasing or decreasing the amount of chipotle to suit your taste. Buy the large dried lima beans if you can find them. They really look amazing and also give the chili a decidedly Southern accent. While we love chili enough to always make it the main event, these two-bite shooters are a great way to still include chili on the menu when it’s not. Add a dash of hot sauce to your bowl for extra heat. Use a variety of your favorite beans, if you wish, in this Slow-Cooker Veggie Chili recipe. This is an all-time favorite for a chilly night. The classic meaty beef chili gets a modern makeover with the combination of three hearty beans and vegetarian ground “beef.” Make this dish in bulk and freeze the leftovers for a lazy dinner down the road. Feel free to change up the vegetables in any way you’d like; butternut squash or zucchini are always delicious additions. A recipe so good, even carnivores will be asking for seconds. Watch your calories–and your watch–with this easy, healthy chili. Lean ground turkey makes a flavorful replacement for the traditional pork or beef, while using a chili seasoning mix cuts down on time spent measuring spices. Butternut squash adds slightly sweet flavor to this classic meatless chili. It's delicious as-is, but you can also add in some corn and bell peppers and substitute black beans for white beans, if you'd like. Butternut squash adds additional nutrients, flavor, and bulk to Turkey, Squash and Black Bean Chili. Serve this easy one-dish dinner over brown rice, or with warm corn tortillas or cornbread on the side. If you make this chili recipe ahead, you may need to thin the chili with water. To save time, combine the sausage ingredients in advance, and finish the chili later. Try this easy 5 ingredient Tex-Mex Chili. Hot chili beans and salsa give this dish some heat. Serve with cornbread or rolls for a hearty supper. 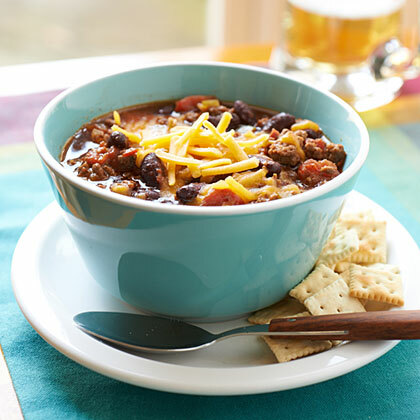 This hearty beef chili features boneless chuck roast and a medley of traditional chili seasonings. Serve with homemade cornbread for a complete meal. Healthy and hearty, this quinoa chili will become a family favorite. The recipe calls for a bottle of beer; use your favorite seasonal brew to amp up the flavor. The alcohol will evaporate as the chili simmers in the slow cooker.